The seeds of power, from Japan to the world. The long story of Daihatsu in the industry has yielded outstanding results and reputation for reliability. Along with the extremely durable engines, which are based on tried-and-tested technology, Daihatsu has developed new technologies to reduce CO2 and NOx emissions, and including the development of Dual Fuel Technology. Research and Development continues along dual tracks that aim to boost power, save on fuel and deliver maintenance free product, while also forging the engineering technology for drastically cutting emissions. Daihatsu cultivates a creative touch and superior technology, and offers value to enrich the society and increase harmony among different groups of people. 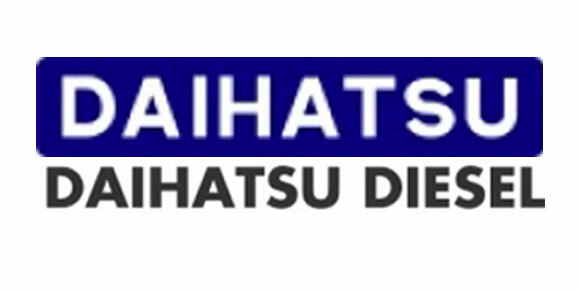 Daihatsu is always moving forward. 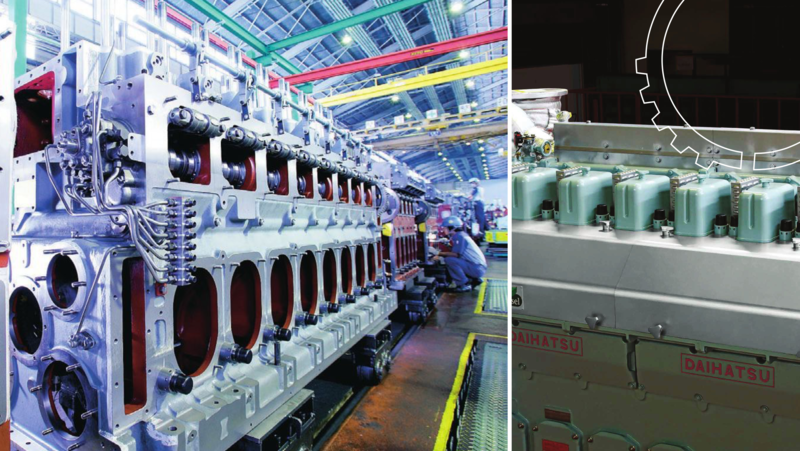 Daihatsu's geared diesel engines comes in a wide line-up from single engine single shaft systems to large multiple input systems. 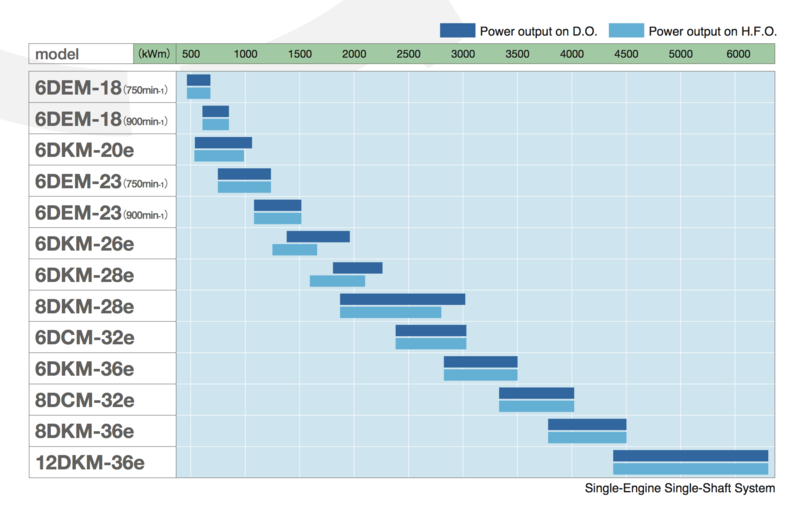 Customers can choose the best system based on ship size, fuel, usage, etc..
Daihatsu Diesel Marine Gensets can be used both as Marine Auxiliary Engines and as *electrical propulsion systems’ power source. *Electrical propulsion systems are di erent from the systems on conventional ships, where the propellers are turned directly by the main diesel engine; instead, the propellers are turned by an electric motor. This energy-saving, next generation system covers economical, propulsion and safety demands. Here too, Daihatsu Diesel engines are working to save energy and lower CO2 emissions. 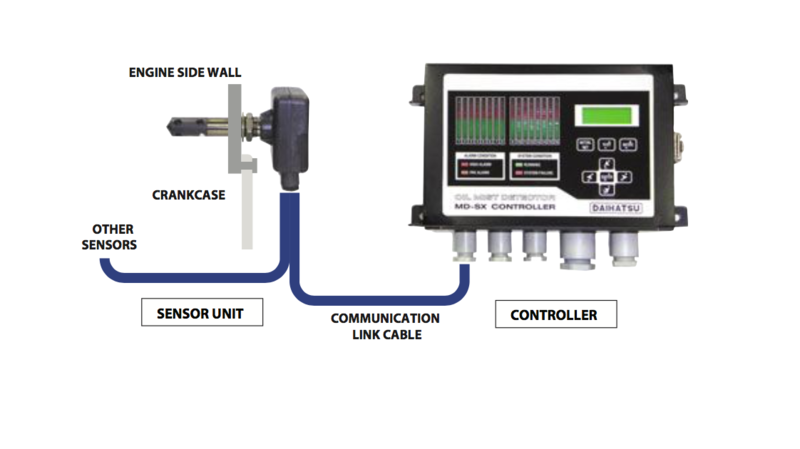 This equipment consists of plural sensor units (optical electronic type, inserted into the crankcase side wall of each cylinder on any kind of diesel engine) and an integrated controller which controls all of the sensor units by the communication link. The controller constantly monitors the oil mist density inside the crankcase and indicates the oil mist level (providing a warning in case the oil mist density will be over normal level, in order to prevent serious accidents). Around 1.5 million parts available anytime. Enables precise and speedy maintenance. The Moriyama Logistics Center is where required parts are dispatched to locations around the world. Daihatsu keeps in stock around 1.5 million parts for repairs and replacement, and these are dispatched with minimal delay. This helps the engineers to perform precise and speedy maintenance. As long as the engines are being operated, this hub of reassurance will continue to operate and act as a team member supporting the customers. Daihatsu wants to access any engine, wherever it’s being operated and is prepared to support the customers on a 24-hour, 365 day basis. Daihatsu Global Support Center offers an IT network that accepts online inquiries from anywhere in the world. It’s linked to 23 countries, incorporates 40 plus bases, and features an extensive database of engine specifications and past records. It is able to provide support to customers 24 hours a day, 365 days a year. Furthermore, it offers reassurance and safety to customers all over the world by sending the expert engineers to any on site location.